Many people wonder if the Coast Guard has an ROTC program, as do the other military branches. The answer is no. The Coast Guard has an Officer Candidate School, and an Academy, as do the other services, but no ROTC program. What they do have, some might think is a better deal than ROTC: The Coast Guard College Student Pre-Commissioning Initiative, or CSPI. Under this program, college sophomores can receive active duty pay at the rate of E-3, as well as a scholarship for their junior and senior year. Upon graduation, candidates attend the 17 week Coast Guard Officer Candidate School and are commissioned as an ensign. After commission, they must remain on active duty for at least three years. The CSPI is a Coast Guard scholarship program for college sophomores (apply as a sophomore, started the program as a junior). The program provides a monthly salary, full tuition, some fees, and the cost of some books during the student's junior and senior year. 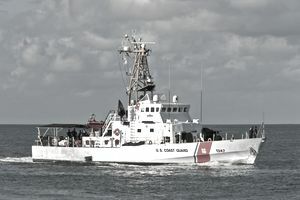 Members in the program must attend enlisted basic training, and participate in various Coast Guard training events throughout the duration of the program. During their junior year, CSPI students attend the Officer Indoctrination School at the Coast Guard Academy or receive on-the-job training at various Coast Guard operational units. Upon graduation, members are guaranteed the opportunity to attend Coast Guard OCS. If the applicant graduates from OCS he/she is commissioned as an ensign in the United States Coast Guard and is obligated to complete at least three years of active duty. Dependency - If single, may not have sole or primary custody of dependents. If married, may not have more than 2 dependents (your spouse is considered your dependent, regardless of military status). Financial - Must meet all financial obligations, and not have a debt to income ratio in excess of 30% ratio of debt to projected income at applicant’s accession level (i.e. at the E-3 level). Online Degrees: Online degrees do not qualify for CSPI - however, individuals attending an online institution may apply if they have acquired a four-year institution’s acceptance to earn their undergraduate degree. Foreign Degrees: Applicants possessing an associate’s degree conferred by a foreign school are required to include in their application a course-by-course assessment from an organization such as Education Credential Evaluators, in addition to the inclusion of the translation of their degree (if in a language other than English). Case-by-Case Consideration: Coast Guard Recruiting Command may consider, on a case-by-case basis, schools not included in the above description that has had a minority student population averaging at least 50% of the total student enrollment for the past three years. In order to be approved, the applicant must be currently attending that school. Service Obligation. In order to enroll in the program, you must enlist as an E-3 in the Coast Guard with a four-year active duty enlistment contract, and a four-year inactive reserves duty obligation. Like all initial accessions, your total military obligated service is a total of eight years. Whatever portion of that time is not spent on active duty is spent in the IRR (Individual Ready Reserves). For example, if you spend two years in the program, then three years as a commissioned officer on active duty, and elect to separate, you are then placed in the IRR for the next three years (total of eight years), and can be recalled to active duty during that time in the event of war or conflict. Enlistment. As mentioned in the paragraph above, you must first enlist on active duty in the Coast Guard as an E-3 and attend Coast Guard enlisted basic training. If you fail to complete any portion of the program, fail to maintain a GPA of 2.5, or drop out of the program, the Coast Guard may (and probably will) reassign you as an active duty enlisted member to a Coast Guard operational unit for the remainder of your enlistment contract. If you then fail to complete your enlistment obligation, you may be required to reimburse the Coast Guard for any expenses they have paid towards the cost of your college education, in accordance with United States Code, Title 10, Section 2005. Duty Requirements. While in the program, you must wear your Coast Guard uniform at least one day per week while attending college classes. You must maintain Coast Guard weight, fitness and grooming standards. Additionally, you must be enrolled for a minimum of 12 credit hours, attend all scheduled classes and work a minimum of three hours per week for the local Coast Guard Recruiter (performing any and all duties he/she assigns you to do). UCMJ. CSPI students are military members on active duty. As such, they are subject to the provisions of the Uniform Code of Military Justice (UCMJ). This means students are subject to court-martial, nonjudicial punishment, or administrative sanctions should they commit a military offense. For example, while in the program, if you decide to skip a class because you want to see the latest movie, or feel like sleeping in late, the CG could punish you for "Failure to Go," which is a violation of Article 86 of the UCMJ. If you decide to smoke a little week with your college buddies on the weekend, and the CG finds out about it, you could be punished for a violation of Article 112a. If you get a DUI or are caught drinking underage, or found to be drunk when you should be in class...well, you get the picture. In addition to such UCMJ punishments, you would also likely be removed from the program and required to perform your remaining active duty time as an enlisted member. Still interested? Then the person to see is your local Coast Guard Recruiter. The recruiter can give you additional details, as well as yearly application date deadlines. What's the Minimum Amount of Time You Can Enlist in the Military? Can You Get Advanced Enlisted Rank for College Credits or JROTC?